To fight against piracy beIN Sports is upgrading its conditional access system. If you are a subscriber to the service then please be aware that your smart card will be obsolete shortly and need to be changed. From mid January 2017, if you don’t use the new card, then you won’t be able to watch your beIN Sports programmes anymore. There will be a nominal fee of £15.00 plus p+p. Please contact orders@viewtech.tv if this change applies to you. 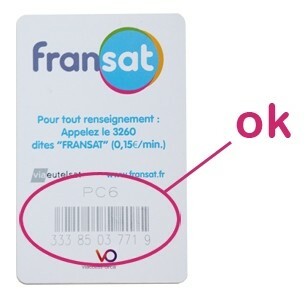 If you already have a FRANSAT card marked PC6 (see below picture), your card does not need to be swapped. Dorcel TV transmissions are transmitting in DVB-S2 which means you will require a high definition set top box. TNT SAT / Fransat Standard Definition Transmissions to Close Soon! French digital TV providers TNTSAT and Fransat are due to close their standard definition transmissions soon during April 2016. Upgrading your equipment is easy, simply change your old Standard Definition decoder for a new HD box. Your existing dish will be compatible. For a full range of TNT SAT and Fransat equipment simply visit https://www.viewtech.tv. Hotbird channel Brazzers TV has moved to a new frequency.